Good question! He’ll probably avoid mirrors from now on. good thing they were rare in that era. But he might want to avoid still water, too. A question for Rollo? That’s awesome. Thanks! Rollo: awwwww. If he were any prouder his sternpost would be wagging. Hahaha! Rollo is certainly very dog-like. Probably has a happy little wake behind him. Rollo is happy Coal is near! He’s like a dog. Hahaha, well that’s a joke! I guess! You know, Coal couldn’t get any farther away without falling into the sea if he tried. . . .
Hi. I’ve been following TMK for a while, and I’m loving it so far. Your art style is simply stunning and, above all, delightfully original. Keep this up! I bet she’s going to be asking about Rollo. After all, his expression has changed rather startlingly. Aw, thank you so much! I love when lurkers comment. 😀 I will certainly do my best to keep on keeping on! Loki: Out of you and Odin, who would win a a competition of general deceit, trickery and all round underhandedness? Coal: If you could choose between Skofnung and Tyrfing, which would you pick, and why? I have a question for Loki: How long do you think it will be before Coal and Hedda get together? And one for Sigyn: How did you and Loki get together? And you don’t mind his… checkered past? Rollo is by far the most smartest and well thought out character and is a cutie patootie. Haha! Sounds like the whole comic should just be about him, then! 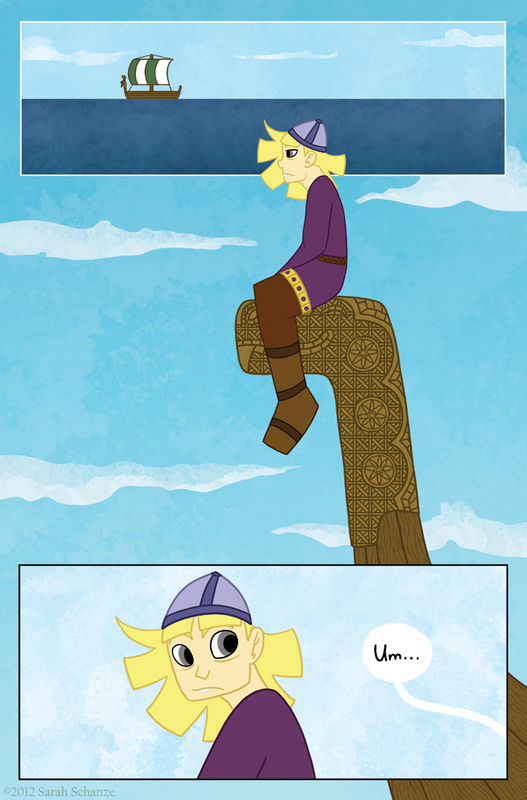 A comic where all that happens is Rollo boating around. I would probably like TMK better, though. Maybe a mini-comic? Haha! Maybeeeeee. XD It’d be fun to figure out anyway. Dear Hedda what do you think of your current situation? And also, EEEEH! Rollo sqeeu!!! Next text bubble : who’s sailing the ship? Haha, good question! Luckily it’s not one to really worry about.